As a kid, my favorite place to sit was on the stairs, halfway up, like Kermit. Neither up nor down. I loved being able to see into both the upstairs world and survey the ground floor comings and goings. There’s something to be said for these ‘best of both worlds’ living spaces in a home – and screen porches are one of the most charming. Sometimes you just want to be in and out. You want shelter and sunlight. You want to watch the world go by without being in the wind. You want to watch nature without being eaten alive by it. And sometimes you just want to be away from your family members! Designed well and built with quality in mind, screen porches can add valuable embellishment to your property and boost its curbside appeal. Plus they’re much easier than open porches to keep clean and ready for use, since you don’t have to sweep away leaves and other debris. Bear in mind though: pollen and snow can still get through. Screen porches make great transitional spaces betweenyour yard and your house. You can connect them to a deck or patio to create fantastic social spaces for parties, barbecues and playrooms. To extend the season for a screen porch and make the most of the sun in the cooler months, choose a south-facing spot for your screen porch. Getting light into a screen porch itself is not usually a concern, but adjacent rooms can be in danger of being dimmed. If you’re building a screen porch near or next to another room, consider the impact: will your newly added roof diminish block light or airflow or both? If possible,add skylights or position the new porch next to a room that has another window. You could retain existing windows as part of the new screen porch, so the internal room can still benefit from borrowed light and air. Even if you and your family don’t have currently mobility issues, you need to consider safety, longevity and salability when building your screen porch. Make sure the floor is at the same level as the floor in the rest of your home. This simple step will service to prevent falls and allow wheelchair access. Install a door with sufficient width for a wheelchair too. 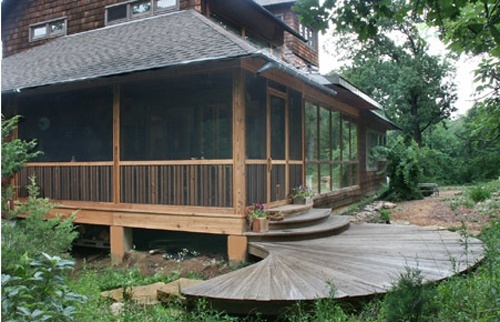 Jutting out on the side, rear or front of a house, screen porches come in for more than their fair share of weathering. This little room needs to withstand the worst of the elements: storm, rain, wind, extreme cold, extreme heat, the weight of snow and ice. But that doesn’t mean it has to look like a nuclear bunker! For the ceiling and floor, natural woods like fir and cedar look stunning and can blend in beautifully with the surrounding nature. For a lower maintenance product, you can ask your contractor about composite materials like Azek and Kleer. Many of our clients choose to use composite on the outside and a more natural substance on the inside.The most durable screened porches are this perfect combination of function and form. Avoid that flat-pack, ‘porch out-of-a-box’ look by adding a few architectural features to your new room such as a high ceiling, a fireplace, decorative latticework or a stunning tile floor. Touches like these make any room appear lived-in, much larger and more loved. 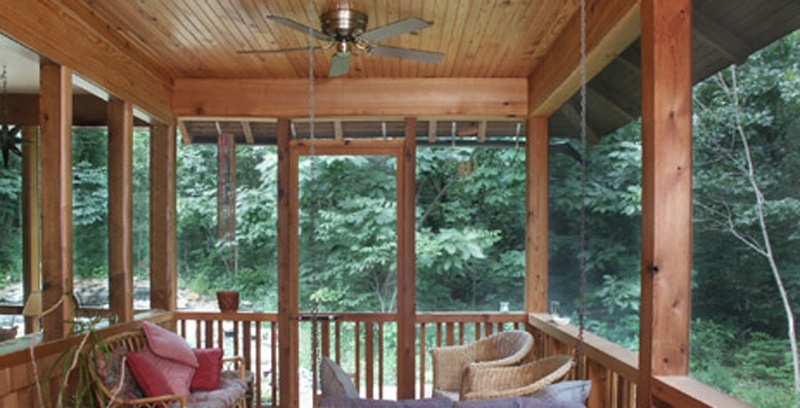 Apart from those in extreme winter climates, most of our clients choose a 3-season screen porch. This means they’re happy to feel the autumn chill and perhaps use the space less during the winter – or just wrap up more warmly. With a little planning though it is possible to extend the season for your porch and use it even when the temperature drops. You can either have removable glass panels made to fit your screened openings, or ask your contractor to build the porch with storm-screen combo units. 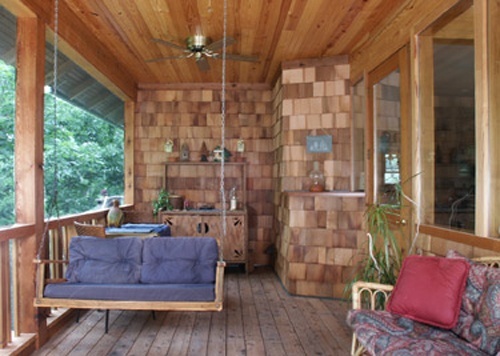 So if like me, you find yourself drawn to those little halfway spaces, extend your comfort zone with a new screen porch. These little rooms add a lot of value and allow you to enjoy the fun of the outdoors with all the coziness of being indoors.